If you don’t already know, Gloomhaven is a campaign-oriented game where each member of your party takes on the role of an adventurer. You and the other members of your party take on various quests as the story unfolds in the game, earn rewards like gold and experience which can be used to make your character more powerful, and permanently alter the game world around you as a result of your actions. The initial description sounds a lot like a game of Dungeons & Dragons with miniatures – and it is. But, it also isn’t. The big-picture concept of the game is exactly like Dungeons & Dragons, but the mechanics of the game while you are in a dungeon are completely different. Without getting into too much detail (going into detail about game mechanics would result in a novel), each character has a deck of cards that has a variety of abilities on it that they must use on their turn to move around the dungeon, execute attacks, or perform any other action. Those cards slowly dwindle away as the scenario progresses, and serve as a sort of store of energy for the characters. Running out of cards means the character has become “exhausted” and must sit out for the rest of the encounter. Yes, that’s right – hidden within this role-playing adventure game is a strategic card management game! Gloomhaven scratches a lot of gaming itches. It covers role-playing and card management, but it also dips into the miniatures realm. The current edition of Gloomhaven includes miniatures for each of the player classes which you can paint if you so desire. I’ve seen more dedicated miniature gamers create 3D printed miniatures for some of the monsters and the various summons in the game which were quite well done. If miniatures aren’t your thing, you can easily and happily run the game with the components unaltered. But if you are a little craftier in your gaming tastes, there is a lot you can do to enhance things. Gloomhaven is clever in the way it handles the Dungeon Master role – there isn’t one. There are a few elements of the scenarios which the players are not supposed to know about, but the flavor text for those items are only to be read at appropriate times. There are very detailed rules governing monster actions which cover any situation you can imagine, making the DM role automated. The game doesn’t recommend one, but we found that things do run a bit more smoothly with a game facilitator … someone to stay on top of the myriad of rules and take care of the “world” stuff so that the players can focus on their characters. Of course, that role isn’t quite as fun as playing for most people, so unless you have someone in your group that really enjoys minding the store, I don’t recommend having a non-player take on that role. Though, there are some players that enjoy being the banker in Monopoly – if you have a friend like that, they are probably your person. Since Gloomhaven is a four-player game, it does give a fifth person something to do. Gloomhaven can get very complex, but if at least one person can follow what is going on, anyone who doesn’t often stray into games more complicated than Settlers of Catan or Ticket to Ride can easily (and happily) manage their own character’s mechanics and leave the world management to people who enjoy that more. As you can see from the photo, the box is huge (pictured is the box next to my son’s Little People Batman – as you can see, it’s quite big!) – Unboxing this game was very intimidating. I’ve opened board games before that had a lot of pieces, and this one blew them all out of the water. I think my first sit-down with getting the game ready to play took about two hours, and at that time it became obvious right away that I was going to have to figure out some kind of storage system. I first tried out the old standby game storage solution – Plano boxes. I found a storage system a user on BoardGameGeek.com developed called Y.A.S.S. 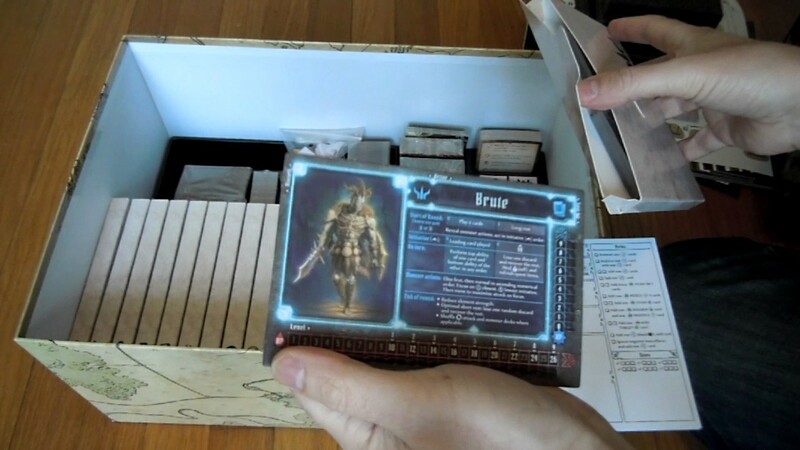 (Yet Another Storage Solution), but as we played the game and really enjoyed it, I decided it was worth it to spend a little bit more on the game and picked up Broken Token’s Gloomhaven Organizer. It was another $80, but it was absolutely worth the cost – every scenario we’ve played since I put this organizer together has been very smooth to manage in terms of piece management. Not that “extras” are needed to enjoy this game, but there are a great many add-ons you can get for this game (official and otherwise) that enhance your enjoyment. Most are free (the unofficial, community-created ones), but there are a few you might have to spend a couple of bucks on. So far, I’ve tried several of both that have been worth it. 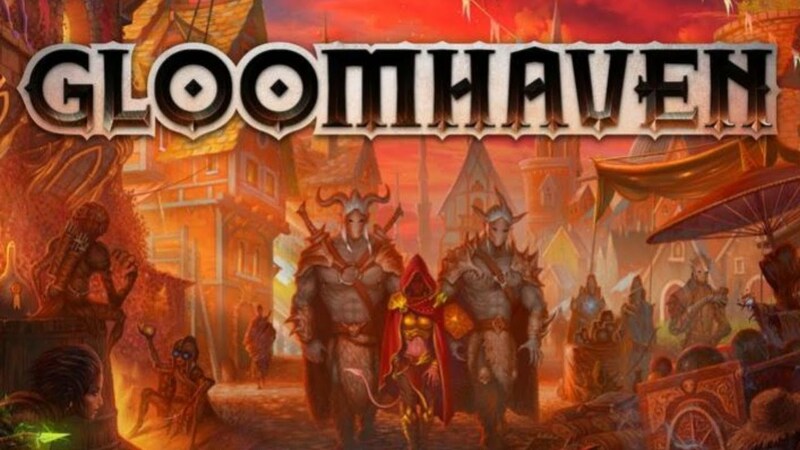 Gloomhaven is becoming very popular in the board game community, and it has been ranked #1 overall by the BoardGameGeek.com for the past several months. A familiarity with BoardGameGeek is very useful as you start to get into this game – not only can you find rule clarifications (the game creator, Issac Childres, is active there), but you can find fan-made maps, card files, and other useful tidbits that may help you as you wade through the rules. I got a ton of use out of an Enemy Focus and Movement Flowchart I found on there, and it seems like every week someone has posted a new file that is in some way useful. There are other extras which I have found very useful. Sinister Fish has put out a removable sticker set for the game. As Gloomhaven is a “legacy” board game, you are expected to permanently alter the board with stickers and destroy cards as the campaign progresses. Few people actually want to do that (in case they want to start over and play again later), so products like this allow you to later remove the stickers if you so desire. Of course, these are removable and not reusable stickers, so keep that in mind if you decide to pick them up. You can take them off later, but then you are stuck with the permanent stickers that came with the game if you haven’t picked up another set! There is also a free Gloomhaven Helper app created by Esoteric Software that takes over the card management of the monster cards and helps manage the players stats, conditions, elements, and initiative during the scenario. This app has been a massive time-saver for our campaign. You only need the app on a single device to really benefit from it, but if other people want to see what is going on, it is possible to run it on a client/server configuration over a wifi network. If you aren’t certain Gloomhaven is right for you, there are many game-play videos available on YouTube if you want to see how the mechanics work. This game is popular enough that there is a very active online community surrounding it, so it is very easy to find whatever information you need to help you decide if this is a game you will enjoy. Distilling everything I’ve already said – this is a great game. If you have a group of friends that enjoys moderately complex board games, can commit to playing something on a long term basis, and can meet regularly – this is the game for you. But even if you don’t have that group of friends – the way this game is designed, you really need only one person. You can happy run a party of up to four characters all by yourself thanks to the game mechanics. If you need to run this game solo, you can do it easily. Gloomhaven retails for $140, and is sometimes a little hard to find despite the price point. It seems like a lot, but we've enjoyed this game so much that I think I've spent almost double that when you include the extras like removable stickers and the Broken Token organizer. I can say with sincerity that it has been worth the cost. My group’s next session isn’t for another two weeks, and I am already getting twitchy just writing this article! If you aren't really a board game fan, you probably don't need to give this game a second look. But if you would like this game - you know who you are, and you are already trying to figure out of you can afford it. Trust me - it's worth the price. I've heard the name and seen references to the game by name, but nothing about its content before...definitely looks like it'd be up my alley! Unfortunately, I don't have any regular group that would play this, and I'm not much for "solo" games. I still have the starter box of Imperial Assault waiting for a chance to play, and Wrath of Ashardalon, both from 3 years ago. I still "intend" to get them played, but opportunities are infrequent enough that they haven't made it through the queue. That $140 is definitely a bit offputting as well, on the surface...that's halfway to a Switch!. But for the size of that box, and what you say about the components, and the replayability and such...that surely offsets quite a bit. And if one is willing to drop $60-$70 on one game, $140 merely doubles that; it's just a larger all-at-once cost vs. a smaller game with additions/extras added piecemeal over time. It's definitely on my "radar," and something I'd love to play eventually! Cost is a huge factor with this game - though in terms of what you get, the materials make it worth it. Everything is very high quality, and there is just plain a lot of it. It is definitely more fun with some kind of group though. I've never played it solo myself, and thought the urge to try pops up, I never really find the time. Finding a group - any group, even if it is just one other person - makes all the difference with this one. I'd hate to tell you not to buy something I think is fun, but I wouldn't invest in this game unless you had someone to play it with.